How can anyone know about the details of a young girl who lived about 1800 years ago? Today our Church universal remembers and honors St. Agatha of Sicily. We aren’t sure if she was born in Catania or Palermo. The trivial details have long been forgotten. What is remembered is her single-heartedness. What has been passed down and written about is how highly she was venerated in Christian antiquity. 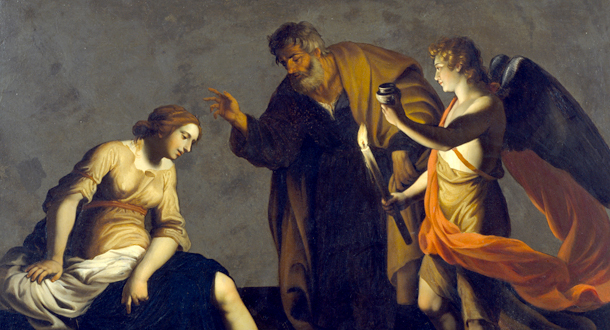 She was put to death during the persecution of Decius for her unwavering belief in God. Agatha is the embodiment of our first reading in the letter to the Hebrews. Persevering in running the race that lies before us, keeping our eyes fixed on Jesus the leader and perfecter of faith, and embracing the joy we find in the presence of Christ is the ideal Agatha lived. She understood it as the fullness and completeness of life. Fr. David Colhour, C.P. is the pastor of St. Agnes Parish in Louisville, Kentucky. Error: Error validating access token: Session has expired on Monday, 18-Mar-19 14:16:37 PDT. The current time is Thursday, 18-Apr-19 19:24:19 PDT.